Nothing signals the arrival of Valentine’s Day like – “Kiss Me”, “Be Mine” and “Sweet Talk” printed on little hearts. Conversation Hearts, aka SweetHearts – Although it’s hard to give credit to just one person for these sugary little treats the NECCO Company is responsible for their popularity. This year, thanks to an online survey one in eighty hearts will say “Tweet Me”. A really modern twist for a 144 year old candy! So what can you do with those sugary little treats that end up at your house besides eat them? Use them for inspiration! Yep! I’m inviting you to join me in a fun filled week at CroppinParadise for the Conversation Heart Crop. There will be an online crop and blog hop from February 7th through the 14th. I hope you can stop by the site and participate in the challenges and the games! Be sure to check back here to see what I have planned for that week. Being off of work the last few weeks has had it's advantages! 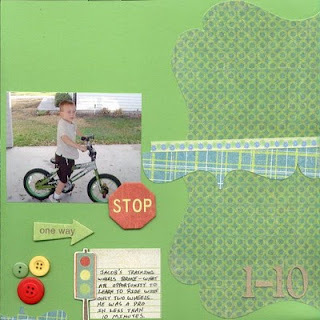 I've gotten a few things done around the house and a lot of scrapbooking projects completed. I've had some time to try some new things and one of my faves is using Crepe Paper - so many possibilities! I'll post that layout after the reveal on the blog at CroppinParadise. Jessica and her boy's have been supplying me with enough photos (I'll never be caught up lol!) to keep me busy. I knew when I saw the car and bike photos the perfect paper for them would be MME Abby Road the Round & Round Collection. That paper is perfect! I love the traffic signal-colored buttons. Great touch! Can't wait to participate in the challenges/crops. Thanks for the reminder. Great layouts Joan!!! 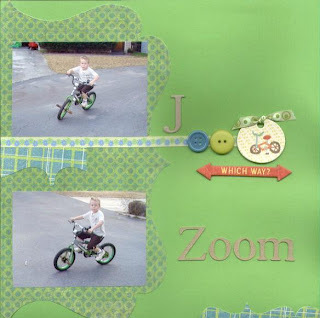 I love that green you used on the bottom 2 layouts. Can't wait for the crop!